RC warbirds from small electric RC planes, to the larger multi RC engine powered WW2 warbirds are discussed. RC kits are shown, along with the latest ARF and RTF RC airplanes. In 1939, at the start of WW2, aviation was in a state of flux. The biplane single seat fighter had reached the ultimate development point. 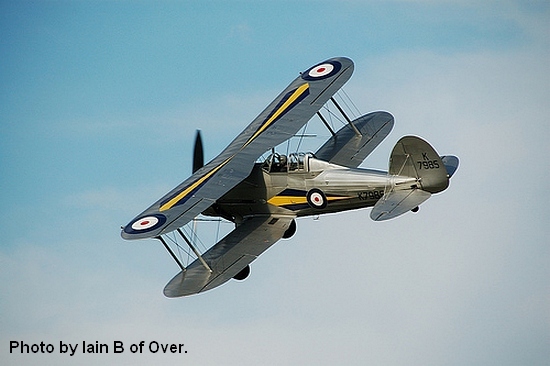 The Gloster Gladiator is a prime example. With an enclosed cockpit and 4 machine guns, it did serve briefly, at the start of the conflict. The 3 Sea Gladiators that bravely defended Malta, are remembered as "Faith, Hope and Charity"
Another remarkable biplane, that served for the duration of the war, was the Fairey Swordfish. Known affectionately to it's Fleet Air Arm's pilots as the "Stringbag", it was able to deliver a torpedo with deadly accuracy. However, the biplane was soon to be replaced by the single seat, monoplane fighter. 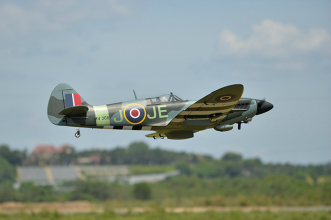 The Royal Air Force was soon equipped with the Hawker Hurricane and the Supermarine Spitfire. Both of these warbirds were powered by the Rolls Royce Merlin. Germany had the Messerschmitt Me 109 monoplane fighter and the USA soon developed it's own range of fighter and bomber aircraft. At the end of World War Two, the jet fighter was just starting service. The Royal Air Force was flying the Gloster Meteor and Germany had the Messerschmitt Me 262. 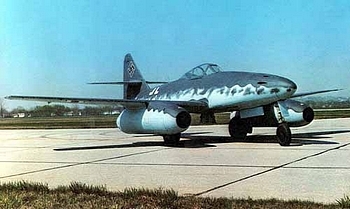 This photo shows the Messerschmitt Me 262. I have seen a few WW2 RC planes that make impressive models of this early jet. There is no doubt that WW2 RC planes are very popular subjects. 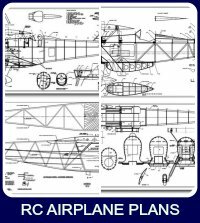 They are available in all sizes and range from the very simplest park flyer, through some of the best ARF RC airplanes, to the highly detailed scale masterpieces, seen at the major scale contests. 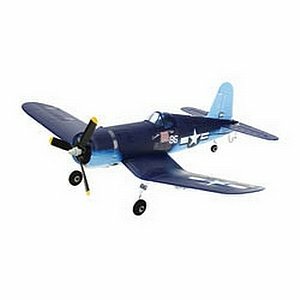 Below you will see some of the best types of RC warbirds available today. The Stuka was used very effectively, at the beginning of the war, as a dive-bomber. It was used largely as a support for the German ground troops and was equipped with a siren that created a characteristic "Wailing" sound. This had the effect of terrorizing the unfortunate people on the ground! 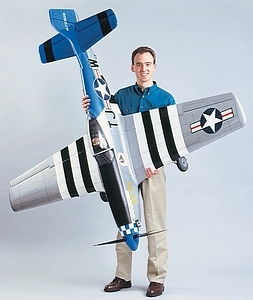 This ARF RC airplane , by Phoenix Models models spans 75 2" and has a finished weight of 10.8/11.9lbs. A 4-stroke RC engine, of from .91 to 1.20 cu.in. is required or full details are provided for electric power. Construction is of conventional balsa and ply, with a printed film covering. 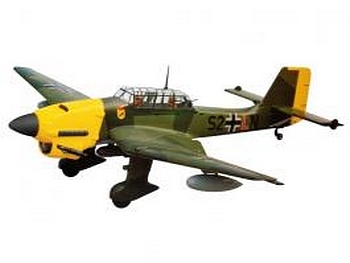 Take a look at this page for details of the Junkers JU87 Stuka. 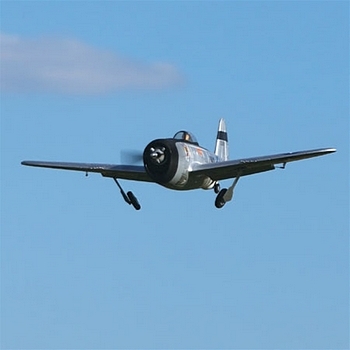 One of the most popular WW2 RC planes, is the Thunderbolt. 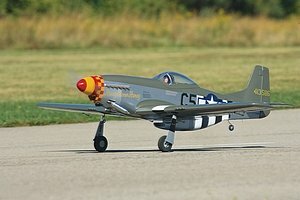 Many RC versions of the P-47 Thunderbolt are described, along with a brief history of the full size Republic p-47 and links to the best World War Two warbird sites, featuring the P-47. Visit this page for more details on the P-47 Thunderbolt. More than 13,000 Warhawks served in World War Two. Here you will find many versions, from small electric powered to the larger glow and gas powered versions. 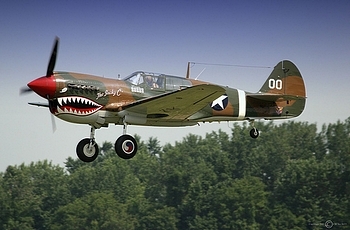 Take a look at this page for more details of the P-40 Warhawk. Maybe the most famous scale model of WW 2. The very popular RC Mustang. Many RC warbirds are described here. Take a look at the page "RC Mustang", for a wide range of types. 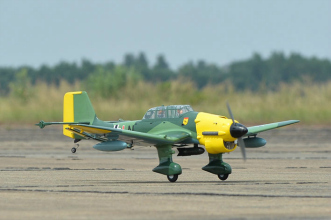 This is one of the best flying ww2 RC planes. Top Flites RC Corsair is big, beautiful and a monokote covered ARF. Made from balsa and ply and ready for installation of gear, it saves months of construction time and is ready for Robart retracts. This mini Corsair can be flown indoors, in a gym or outdoors in a dead calm. Either way it is great fun! 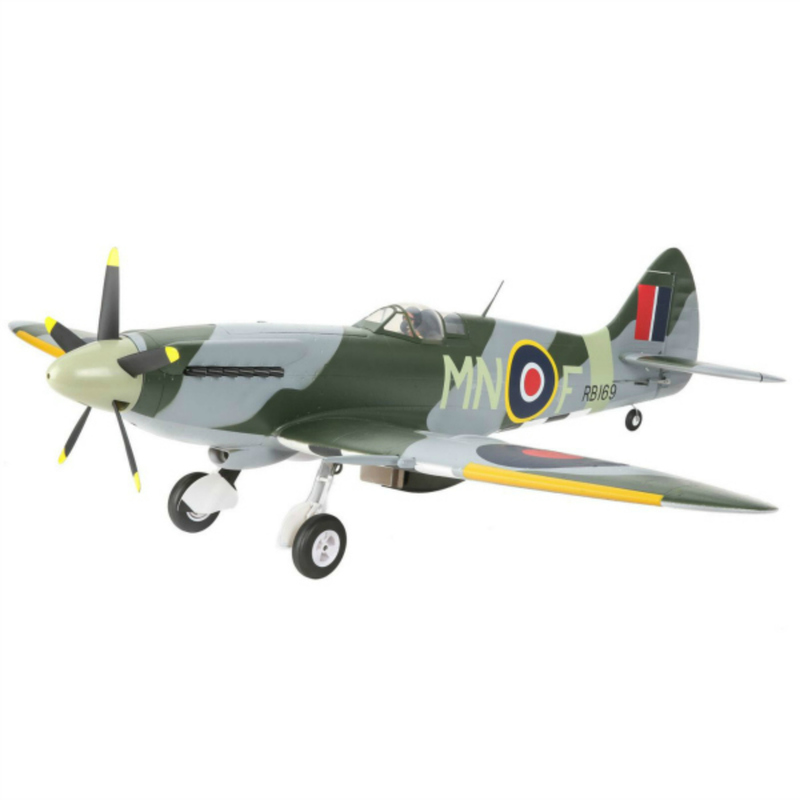 Available as a RTF or a BNF WW2 RC plane. For more information visit the page "F4U Corsair." This model is no longer available, but the information can still be of interest. Both of these kits are described on this page, as well as the accessories, to complete a great WW2 plane. 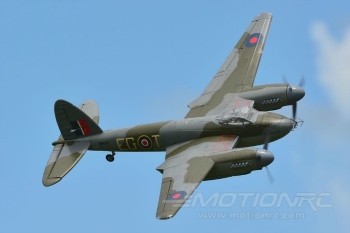 Click here for more details of maybe the most well known of the British RC Warbirds. Unfortunately this model has been discontinued but we keep the page for those interested in this model. Click here to visit the page. Click here or on the photo, to visit the page dedicated to this "Foam Wonder"
Quite large at 55 in. wing span and rugged electric retracts. The British "Spy Plane" of WW2. Click here for more details of the full size airplane. Click here to visit the page with full details and photos. It is sold by Tower Hobbies, so service before and after sales is guaranteed! Another of the new ARFs being offered by Tower Hobbies. If Tower are selling it, it must deserve a look! 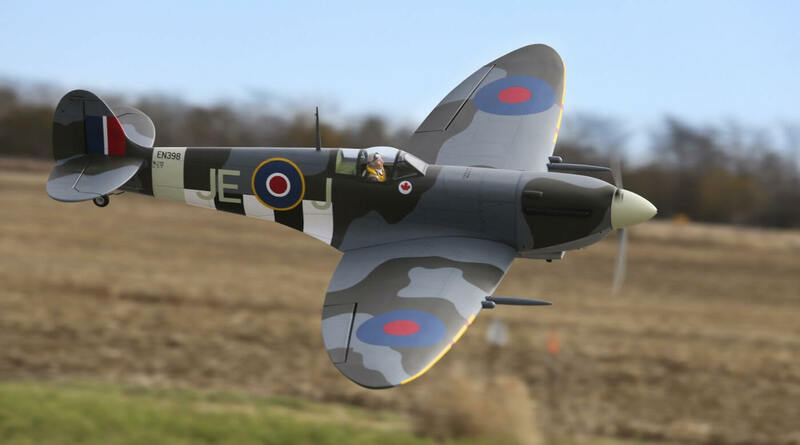 This maybe the most popular large scale Spitfire available! She can be gas, glow or electric and comes ready for electric retract installation. Click here or on the photo for full information.